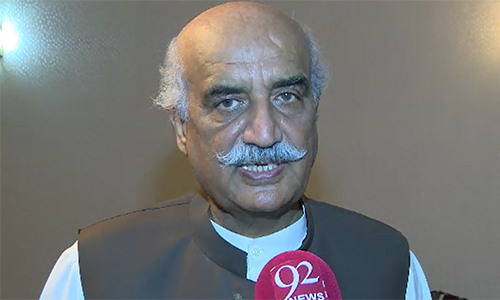 ISLAMABAD (92 News) – Pakistan People’s Party leader Khurshid Shah on Tuesday demanded the Election Commission of Pakistan members to resign and Pakistan Tehreek-e-Insaf should stay in the parliament. Talking to media after Public Accounts Committee meeting, Khurshid Shah endorsed the demand of PTI chairman Imran Khan and said that Election Commission members should go home keeping in view the Judicial Commission’s report on alleged rigging in 2013 general elections. Commenting on the de-seating of the PTI leaders, he said that the government and opposition have called the PTI leaders in the parliament and he does not think Nawaz Sharif would make Imran Khan a leader by throwing him out of the parliament. The opposition leader said that the PPP respects the mandate given by the people, adding that the PPP does not want to rule but the PPP wants to strengthen democracy in the country. Khurshid Shah said that they had cordial relations with Muttahida Qaumi Movement (MQM), adding that the government should bring MQM to the mainstream.